KOKOMO, Ind. — The Indiana University Kokomo Art Gallery features its first-ever show created by senior fine arts students. 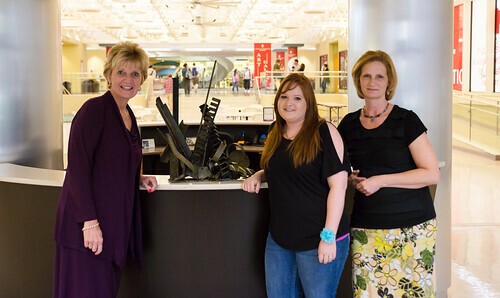 Chancellor Susan Sciame-Giesecke stands with Nicole Brubaker and Minda Douglas. See more pictures on Flickr. Eight students are showcased in the Fine Arts Thesis Exhibition, which continues through Saturday, May 17, in the Art Gallery. Susan Skoczen, art gallery director, said five of the students are receiving the Bachelor of Fine Arts (B.F.A.) degree, with two earning the Bachelor of Arts degree. An additional senior, who minored in creative arts, also will have work in the gallery. In previous years, thesis work was featured in the annual student exhibit, but this year, with the largest number of seniors ever to participate, all the gallery space was needed for their exhibit. "This is the chance for seniors to put together their first body of work, and to gain experience of what it is like to be a professional artist," Skoczen said. "From the start of deciding upon a concept for their thesis, to the research, to the physical making, and then even how to frame and install the work in the gallery, these students are doing it all." Nicole Brubaker, a B.F.A. student from Flora, enjoyed the experience of creating a themed exhibition, something she hopes she will get to do as a working artist after she graduates. "I've always had a passion for art," she said. "I've grown as an artist while I've been at IU Kokomo, and learned how to use art as a communication tool." Her theme is "Isolation," and she admitted it was difficult to decide which pieces of her work complemented the theme, and which should not be included in the show. "That's part of the learning process, because including those pieces would have thrown off my theme," she said. "I've learned to make those hard decisions, even though it's hard to see something you worked hard to create sitting at home." The exhibition includes sculpture, painting, printmaking, mixed media, drawing and digital art. Seniors in addition to Brubaker include William Black, Logansport; Wendy Brown, Russiaville; Daniel Speight, Kokomo; Dusti Speight, Kokomo; Theresa Stewart, Bunker Hill; and Sarah Willis, Russiaville. Bryan Crow, Kokomo, is a creative arts minor. Admission and parking are free. Gallery hours are 10 a.m. to 4 p.m. Tuesdays and Thursdays, 10 a.m. to 8 p.m. Wednesdays, and noon to 4 p.m. Saturdays.